Hidden under the cover of today’s advanced mobile devices, there are innovative semiconductor and LED solutions built in to enable new features and technologies consumers are continuously seeking. 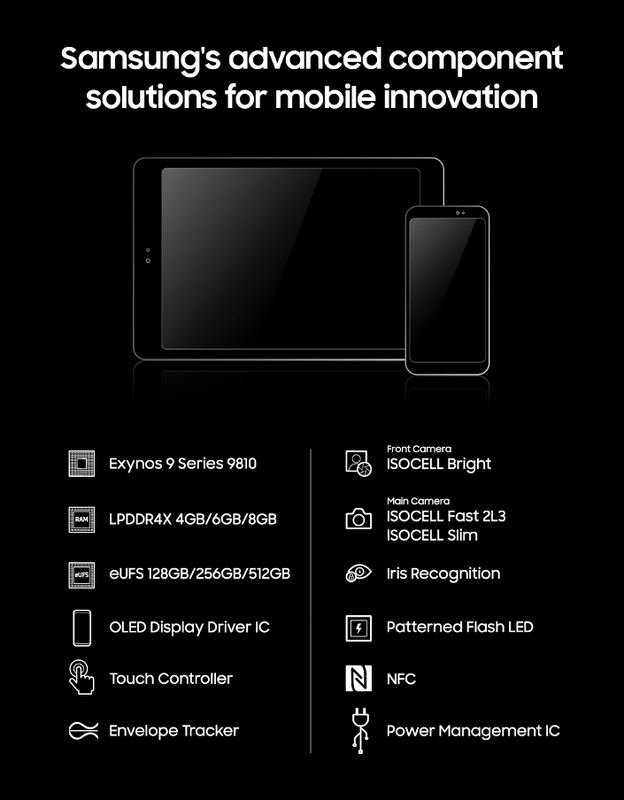 With its decades-long technology innovation and expertise, Samsung Electronics’ Device Solutions Division provides an extensive range of semiconductor and LED solutions to meet the ever-increasing requirements of the mobile industry. While not always visible to end users, Samsung’s component solutions have been utilized comprehensively to raise the level of what’s possible for mobile devices, and help enable a world of difference in performance and user experience. Here, we go under the hood, to take a look at some of these solutions. One prime example of Samsung’s component innovation is the Exynos 9 Series 9810 processor, built upon the company’s latest 2nd generation 10-nanometer LPP process technology. The processor delivers powerful mobile computing performance with its 3rd generation CPU and seamless connectivity with a 6-mode/all network supporting 1.2Gbps DL 6CA Cat.18 LTE modem. Working in tandem with the Exynos processor is the LPDDR4X memory chip, the industry’s most up-to-date mobile DRAM solution that provides breakthrough RAM performance and energy efficiency. Available in a compact package offering up to 8-gigabyte (GB) capacity, the LPDDR4X enables prompt multitasking and data processing for advanced mobile applications such as 4K UHD video recording and virtual computing. Also, under today’s heavy multimedia and content use environment, users can safely store their valuable data on Samsung eUFS, an embedded high-speed mobile storage solution for flagship devices. Based on Samsung’s proprietary V-NAND technology, the eUFS features ultrafast data read and download speeds as well as abundant storage capacity as high as 512GB. The Samsung ISOCELL Fast 2L3, a 3-stack fast readout image sensor with an embedded 2Gb LPDDR4 memory, enables significantly enhanced mobile imaging and video functionality with the ability to record at 960fps for brand new features like stunning slow-motion video shooting. Also among Samsung’s broad image sensor lineup is a front-facing ISOCELL Bright image sensor, which enables high-quality selfies on mobile devices even in very low light settings, using leading-edge pixel technologies. In addition, Samsung’s Patterned Lens-Integrated Flash LED component, positioned next to the rear camera, enhances the quality of images even further with its high luminous intensity and uniformity. Samsung continues to reinforce security, power, and touch command management on mobile devices through an array of component solutions. For example, its new iris sensor enables a fast yet highly secure option to unlock or authorize application access, and the touch controller enables instant feedback at the tap of one’s finger. Last but not the least, Samsung’s power management IC delivers a stable supply of power, supporting devices to perform with optimal energy efficiency. As mobile devices continue to evolve, Samsung Electronics’ Device Solutions Division will remain committed to developing and providing its customers with semiconductor and LED technology with distinct value, and providing the best in performance, capacity, functionality and energy efficiency.